Cass and I worked on this little project in the kitchen on our Sunday evening yesterday while Alycia and Sherilyn continued shopping with their grandma at Mid Valley Megamall. In the car, on our way back from Mid Valley, Cass and I were discussing what to have for dinner. We could not settle on anything that’s healthy (not salty, not oily, no MSG) that’s restaurant / store bought. 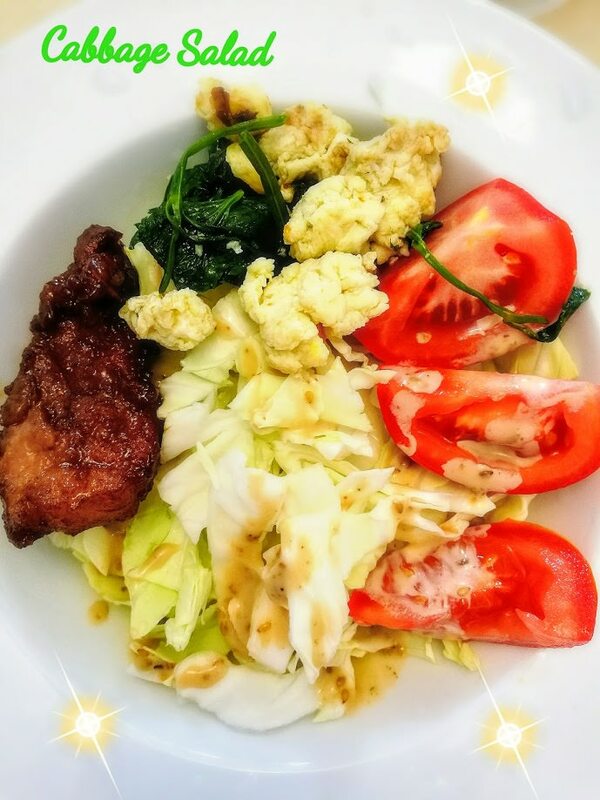 So I suggested homemade Japanese potato salad, which is Cass’ favorite salad but I had a condition ~ she had to help prep the dish. Cass was more than eager to help! One large handful of organic cabbage, thinly cut. Lazy me used a pair of kitchen knife to cut. ~ Cut potatoes into 3-4 wedges. ~ Mash the potatoes with a fork but not until smooth like mashed potatoes. Leave some bitey chunks unmashed. ~ Season with salt, pepper and Japanese mayo. I did not have enough mayo and used Uncle Jeff’s Creamy Parmesan Caesar Dressing (from the Beerenberg family farm in Australia). This salad dressing is my favorite. Cass did most of the work from peeling to chopping, mashing to seasoning. The remaining plate of cabbage is all mine. I love raw cabbage with Uncle Jeff’s salad dressing. Cass wanted to try out this kitchen hack that she watched from You Tube to see if it really works. It requires putting a little water in a bottle together with the hard-boiled egg and then shake the bottle vigorously. Remove the egg from the bottle and zap off the egg shell effortlessly in just one peel. It worked! This salad is so good I can eat it everyday. It tastes even better the next day. For those on a diet, you can add more cabbage and eggs and reduce the potatoes. It’s a pretty complete meal too with carbs, protein, fiber, iron and vitamins! The past three evenings have been super duper hectic for me. I’ve been training new part-time maids in between chauffeuring Alycia and Sherilyn back from school, to and fro tuition and dance classes, on top of revising with Cass who is sitting for her final exam this week. Dinners are normally at my work desk, sometimes swallowing a spoonful or two before rushing off to fetch Sherilyn back from school and only finishing it half an hour later, by then the food had already turned cold. My most trusted and much loved part-time maid, Maria has gone back to Indonesia to get married. She finally summoned the courage to ditch her East Malaysian Chinese boyfriend of 10 years who has no serious intention of marrying her to marry an Indonesian man whom she has only known for a year. I hope that Maria will find marital bliss with her new hubby. And I pray that she will return to work for us after 6 weeks as promised. Maria has been a God-sent helper of 6 years to me and has brought a lot of joy and peace to my life. We treat her as part of our family. Life is tough without her coming over to help me in the evenings. The new temporary part-time helper whom Maria recommended to me stopped working after just 2 days as she is afraid of walking home at 9 at night. She found her friend Wati, to replace her and thank God Wati seems very capable and has an amiable disposition. But the same issue cropped up. Wati is also afraid of walking home at night. Yesterday she asked if she could bring along a friend to work together with her so that she has company in her nightly walk back home. I was very reluctant but acceded anyway as I know the feeling of having to walk home alone in the dark. I went through this phobia for 6 years before I finally moved out from my rented room in Jalan Ipoh when my handbag was snatched by a scumbag motorcyclist and then bought my first car. But this friend whom Wati brought along is O.M.G.! She looks like a hoyden of a thug who has ciggie breath when she talked. I almost wanted to blurt out and ask Wati whether her friend is a male or a female! She certainly does not look like someone I want in my house with 3 young girls and an elderly mil. On some nights, I have to leave Cass at home alone with the maids while I fetch the two older girls back from tuition, Muay Thai or dance class. I felt really uncomfortable just talking to that tomboy who even named herself ‘Din’ (a Malay name for males). Long story short, I told Wati that I can’t accept Din to work with her in our house. Today when I Whatsapped Wati to ask if she’s coming for work, she lied to me that she has fever and can’t come. I was forthright with her and asked her whether she still wanted to work and she said NO. Fine. This means I will be maid-less until Maria comes back mid of November, that’s if she ever comes back. In the meantime I tried calling all the part-time maids’ numbers stored on my phone but as fate would have it, all the numbers seemed to be out of service / unreachable. I’ve had a maid almost half of my life ~ 10 years with a full-time maid and 7 years with a part-time maid. Now I have to adjust my lifestyle and learn to live without a part-time maid. I’m sure I’ll be resilient enough to live without someone helping me. Worst case scenario is to pick up the phone and order an hourly paid maid through a maid agency. Everyone in the house will have to sacrifice and help out to make the household run smoothly. I may even have to relook at our kitchen layout and engage our contractor to find a way to install a dishwasher. Cass is sitting for her Science finals today. Breakfast for her today is pan-fried sweet corn fritters (cooked yesterday evening and heated up in the toaster this morning). Lunch for her is takeout salmon shio yaki bento. Dessert ~ cut orange, mango, organic cherry tomatoes and a glass of freshly squeezed grapefruit juice lightly sweetened with Manuka honey. My breakkie this morning was something pretty healthy ~ high in protein, high in fiber and almost zilch carbs. Leftover dinner from last night, eaten cold: organic long beans omelette, organic broccoli and red + yellow bell peppers. I only remembered to snap this photo half way through eating, thus what you see here is just the remains. Broccoli is a nutrition powerhouse that supplies loads of nutrients for few calories. While there are no single ‘superfoods’ that can prevent cancer and certain risk factors for cancer are unrelated to diet, there is evidence that eating a healthy diet can reduce the risk of cancer. A key component of broccoli is a phytochemical known as sulforaphane, which also gives broccoli a slight bitter taste. Studies have shown that sulforaphane may play a part in enhancing detoxification of airborne toxins, such as cigarette smoke, and could help reduce the risk of certain cancers. Further research has suggested that broccoli may have anti-cancer properties and could reduce the risk of prostate cancer. After a healthy breakfast, I had another high protein lunch of char siu, siu yoke and curry noodles with the hubs at Happy Garden. One of the best siu yoke in the Klang Valley can be found at this kopitiam. Sorry I forgot to take note of the name of the kopitiam! This roast meat stall used to be stationed at Kedai Kopi & Makanan Mooi Mooi (corner lot) but the owner has since moved his stall to another kopitiam just next door. He is now occupying the whole kopitiam. The once dark and rundown shop is now refurbished and transformed into a brightly lit Chinese herbal wholesale business. Same owner (man in blue tee) in different kopitiam now. Best in the world melt-in-the-mouth charcoal roasted siu yoke! And this is the owner’s claim to fame! No one else makes such crispy siu yoke that melts in the mouth as him. But I can’t stomach so much fat and don’t fancy fatty food. After a few pieces of siew yoke and a few pieces of 99% lean char siu, I already felt cloy. The hubs with a bottomless pit chomped down 2 small plates of siu yoke, 1 small plate of char siu and 1 plate of rice. Patrons are free to help themselves to the gigantic pot of aromatic soup (chicken feet with radish) outside the shop. Damage today for 2 small plates of siu yoke, 1 small plate of char siu, 1 plate of rice and takeaway char siu, siew yoke and roast chicken with 1 packet rice (enough for 2-3 pax) was RM113. Pretty reasonable eh? The bowl of curry noodles was from the kopitiam next door. Drama Queen whipped up a big portion of smoothie bowl for dinner for herself last Sunday. 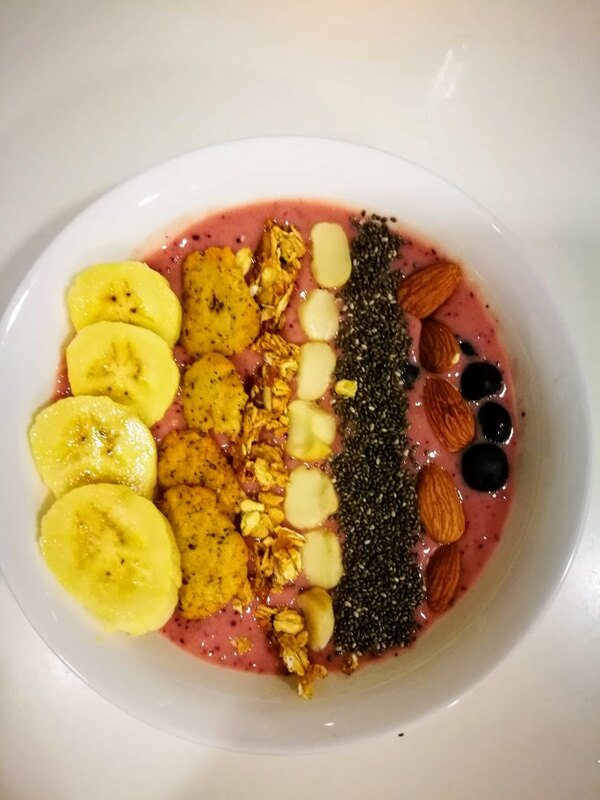 The vibrantly colored smoothie bowl is composed of: half a frozen banana, home-boiled roselle tea with Manuka honey, frozen organic blueberries and an orange. All these ingredients blitzed. Toppings: sliced bananas, organic passion fruit cranberry cookies, granola, raw macadamia nuts, organic chia seeds, toasted almonds and organic blueberries. Have you heard the new thing about smoothies? 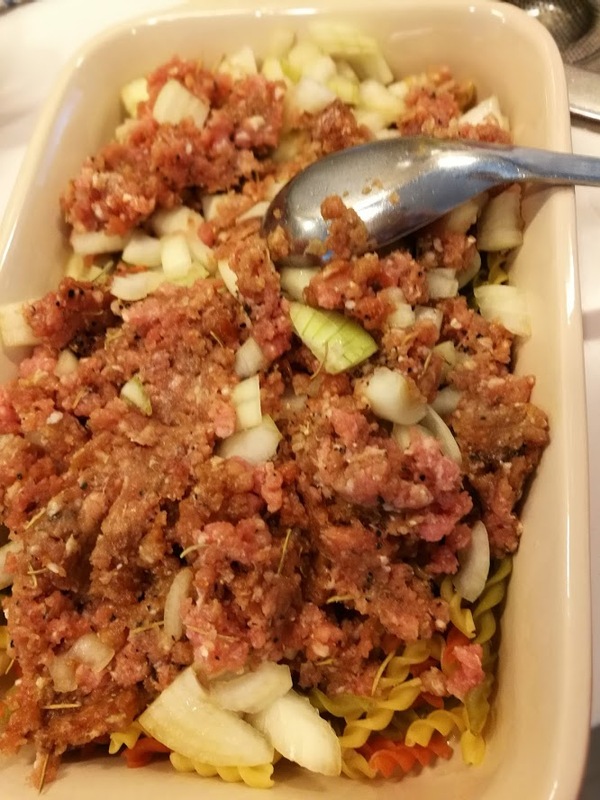 You can put them in BOWLS and with the addition of toppings to make them into even more of a complete meal that’s really filling, nutritious and yummy! This morning I didn’t feel like eating bread or granola for breakfast. Must be the hormones playing tricks again. I was just craving for protein. It must also be my body’s way of telling me that I need more nutrients before Aunt Flow visits soon. I had a handful of crunchy walnuts and pecan, which the mil roasted over the weekend. 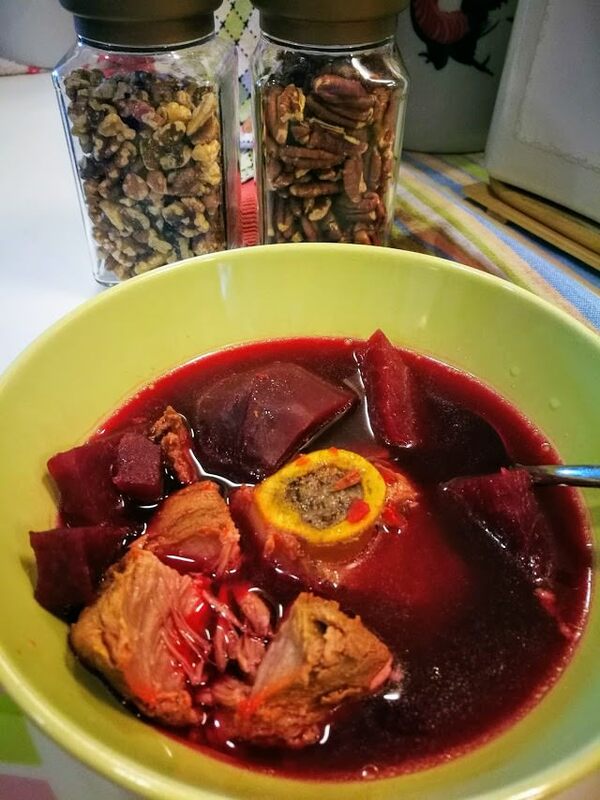 And a big bowl of sweet beet root carrot soup with yummy tender fleshy pork bones. Eating healthy proteins can really fill me up until lunch, without any craving for something sweet. Did you know that protein is the single most important nutrient for weight loss and a better looking body? A high protein intake boosts metabolism, reduces appetite and changes several weight-regulating hormones and it is scientifically proven (1, 2, 3). Lunch today was roasted pork bone porridge with dried scallops. Breakfast for Alycia and Cass on a Monday morning yesterday was walnut wholemeal bread ~ spread with butter for Cass and avocado for Alycia. 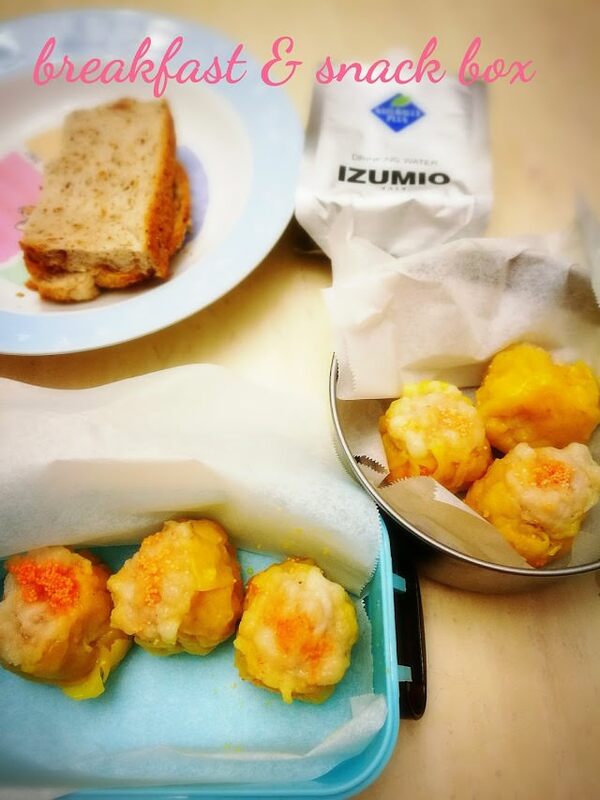 Snack box for recess was steamed ‘siew mai’. After over a week of living on semi solid food, Alycia finally got used to having braces on her teeth. She is eating pretty normally now ~ even chocolate chip cookies, hard muruku and nuts. Way to go girl. I knew you could do it! 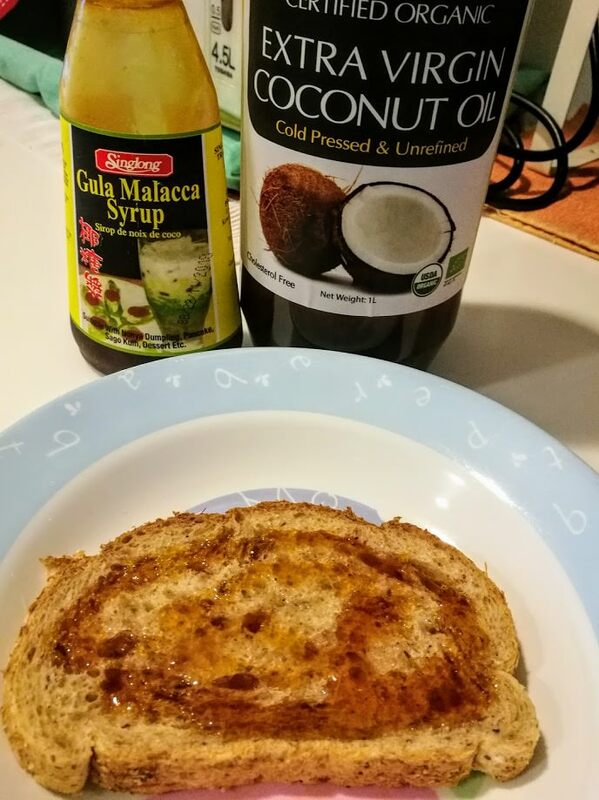 A slice of wholemeal bread drizzled with a tablespoon of organic extra virgin coconut oil and Gula Melaka syrup (palm sugar). Love this simple, wholesome yet delish coconut bread! Coconut Oil is amazing for hormone health. It provides the necessary building blocks for hormone production, can assist weight loss, reduce inflammation, and even has antimicrobial and antibacterial properties. My favorite way to consume it is to blend into coffee and use it as bread spread sweetened with palm sugar syrup. Today is the last day of school for Drama Queen and Cass. For Drama Queen, it is the final day for her in that school where she spent 6 years of primary education there and made many good friends. She has gone to the shopping mall with her gang of besties now to have a last get-together. This year has been an extremely eventful and busy year for Drama Queen. Well, for me too. Yesterday the UPSR results were out. For someone who had only put in 30%~40% effort revising for all her exams, I would say that the results were not bad. I had actually expected worst off results. What is truly unbelievable to me is how she can score an ‘A’ for Chinese Writing!! When Drama Queen told me that one of the As is for Chinese Writing, I didn’t believe her as Chinese has always been her weakest subject. Nonetheless, I believe it was her creativity in writing that earned her an ‘A’. Kudos, Sherilyn! Today marks the end of a 6-year chapter in Drama Queen’s life book. In 5 weeks, another even more exciting chapter awaits her and me. I pray that I will be able to manage this audacious and fearless girl who will turn teenager in less than 3 months. She has never failed to give me endless surprises, heart-stopping moments and plenty issues to overwork my grey matter, both at school and at home. Drama Queen’s super hectic year has yet to come to an end. In fact, many exciting events are lined up until year end. She has a certificate and trophy presentation at Kidzania next week (thanks to Gleneagles), an ukulele camp end of November and an ukulele performance at a shopping mall in December. And the highlight of the year for her is not so much completing her UPSR exam but of her taking a flight with Alycia to Hong Kong sans her dad, grandma or me following. It will be Alycia and Drama Queen’s first time flying overseas on their own!! It’s a totally unplanned trip, courtesy of their ever generous aunt (hubs’ sister) in Hong Kong. A few years ago, Alycia and Drama Queen were gifted the same offer by their aunt but I wasn’t ready yet to let go of them traveling without adult supervision. I THINK I am quite ready now as they had traveled overseas several times and are quite familiar with the procedures. I think these 2 sisters will have a blast. After Hong Kong, we will be back in Ipoh for a week and the following week will be our road trip to Singapore to visit my new twin nephew and niece. I can’t wait to cuddle the two cuties. But first things first. We MUST renew our passports PRONTO as they have expired!! 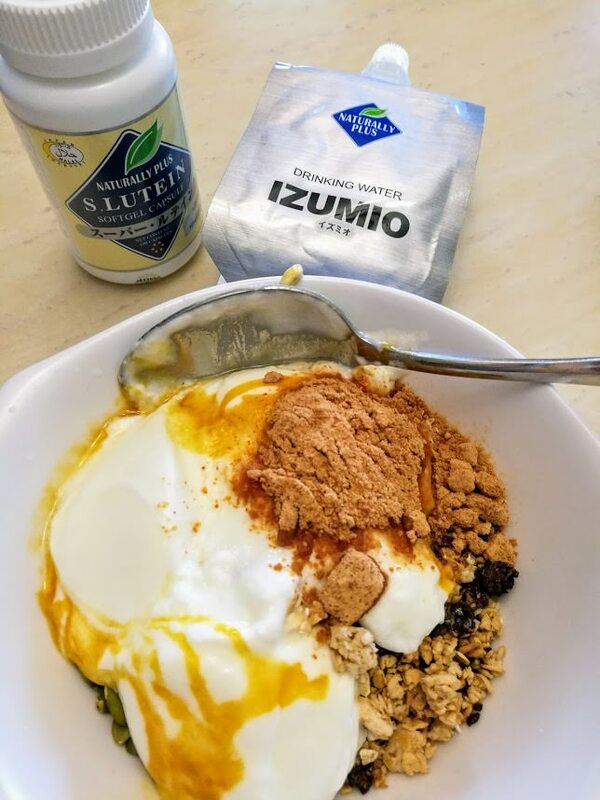 My healthy breakfast this morning: skinny sugar-free yoghurt with raw instant oats, raw pumpkin seeds, seasoned Korean seaweed, mum’s homemade fish floss and drizzle of palm syrup. 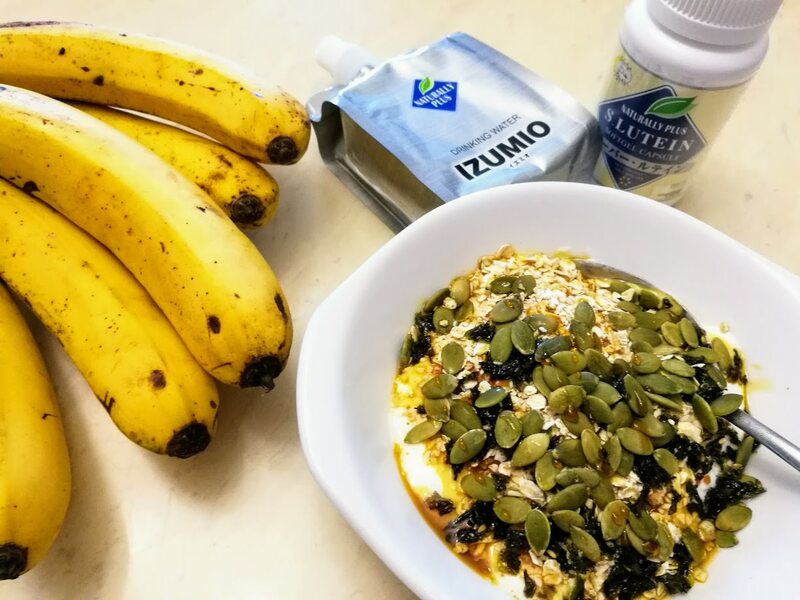 A banana (high in prebiotics) and my dose of Izumio and Super Lutein. Pretty similar to what I had for breakkie yesterday. I need to pump in lots of good bacteria into my guts now. 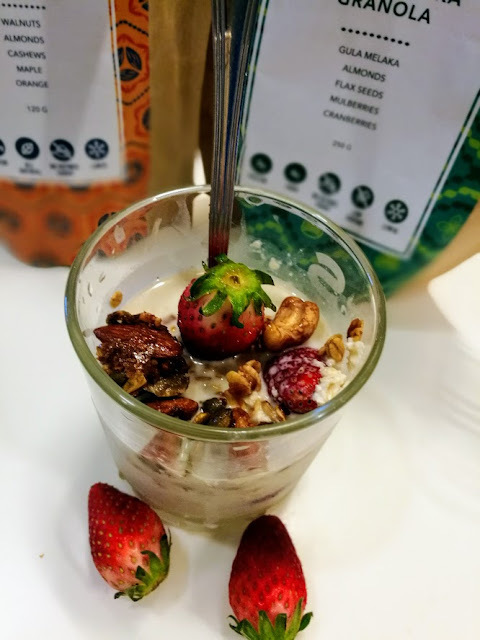 Skinny sugar-free yoghurt with granola, raw instant organic rolled oats, raw organic pumpkin seeds and mum’s homemade Mackeral fish floss drizzled with palm syrup. 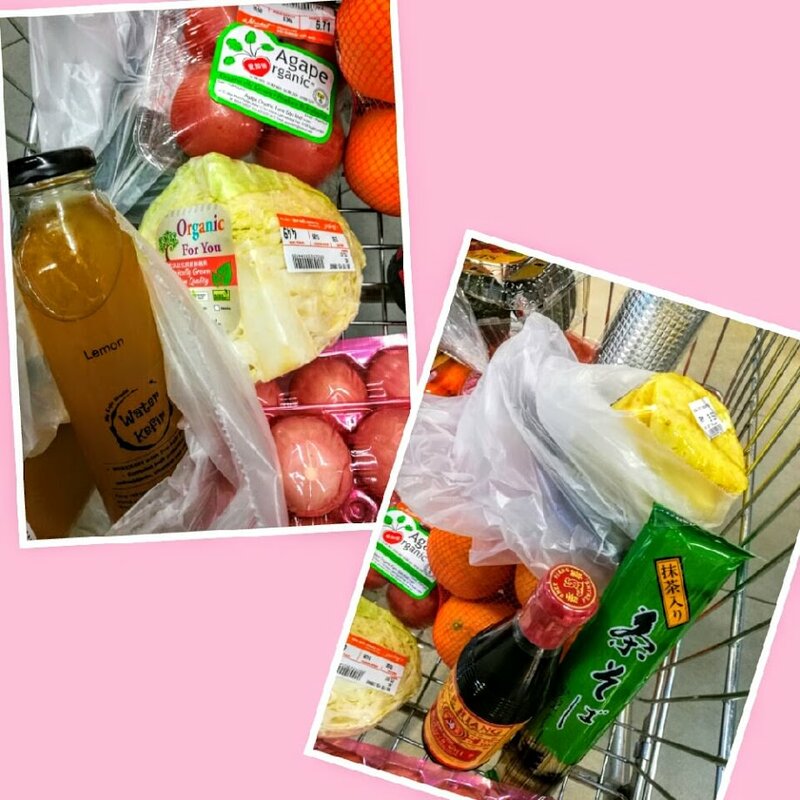 Not forgetting a pouch of Izumio hydrogen water and 3 caps of Super Lutein, my daily must-have antioxidant water and antioxidant supplement. On Sunday night, I had the worst ever kind of abdominal pain followed by purging, vomiting and retching. Sitting at the throne from 12 ~ 1 a.m., I thought that I was dying a slow and painful death, I kid you not. Thank God I could still wake up at 4:45 p.m. the next day to get the girls ready for school. The purging and vomiting must have been caused by half a cup of overnight coconut water that I drank in the afternoon and the food that we had at Avenue K. After dinner I popped my second and final dose of Zithromax. I was required to take 4 capsules of Zithromax at one go on 12 November and another 4 capsules at one go a week later on 19 November, on top of another another type of antibiotics (Metronidazole), of which 2 tabs are required a day for 10 days. Can you see how wrecked my guts are now? Since I started the antibiotics 10 days ago, my stomach has been acting strangely and has been very sensitive. I can no longer stomach spicy food and I have to be very careful with what I put into my body, else it will protest violently with cramps and nauseous feelings. This is the reason why I am anti antibiotics. But when faced with a do or die situation, I had to surrender. After an agonizing 1 hour in the bathroom purging till my bottom became sore and puked till my bitter bile fluid was all retched out, I was drenched in cold sweat. My face was pale white. It was then that I felt a little better. Busy moms and dads, you’ll thank me for posting this recipe. 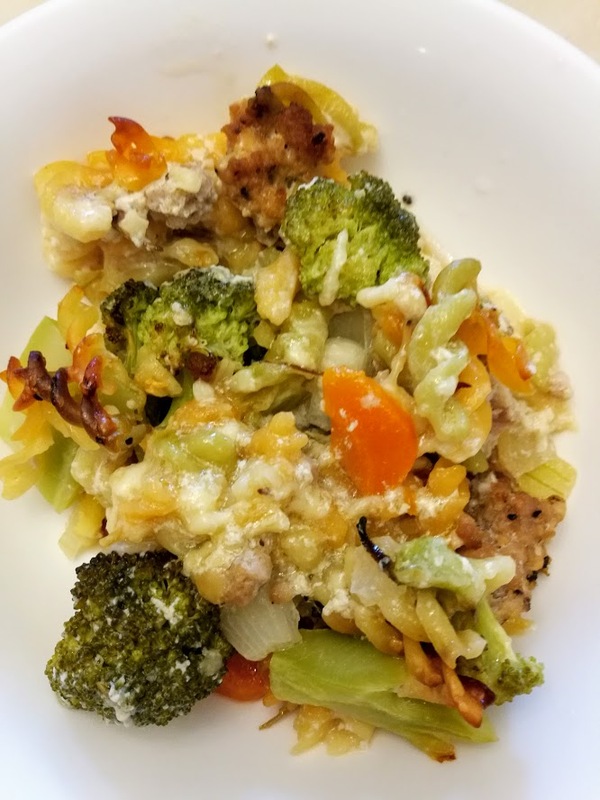 It’s an ultra easy and fast healthy pasta to dish out not only for your little ones but for the adults too. 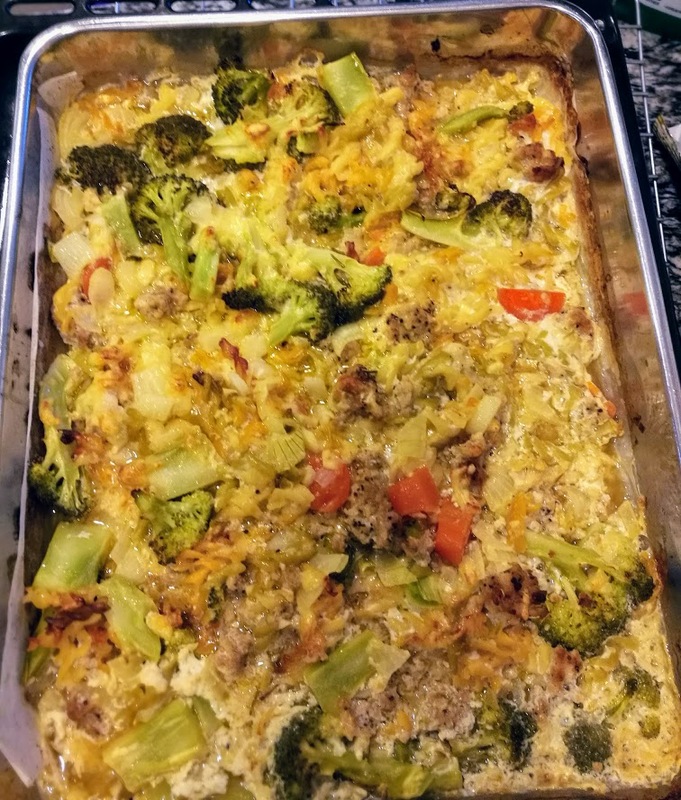 This is a complete meal that takes under half an hour to prep, made in ONE baking dish, there’s no need to crank up the stove, no oil splatter and it’s absolutely yummy. It’s 100% healthy with no crap, cooked only using fresh and mostly organic ingredients. I used organic broccoli, organic pasta, organic chicken (for broth) and organic pork. Just plonk flour, UNCOOKED pasta (YES, you read me right! 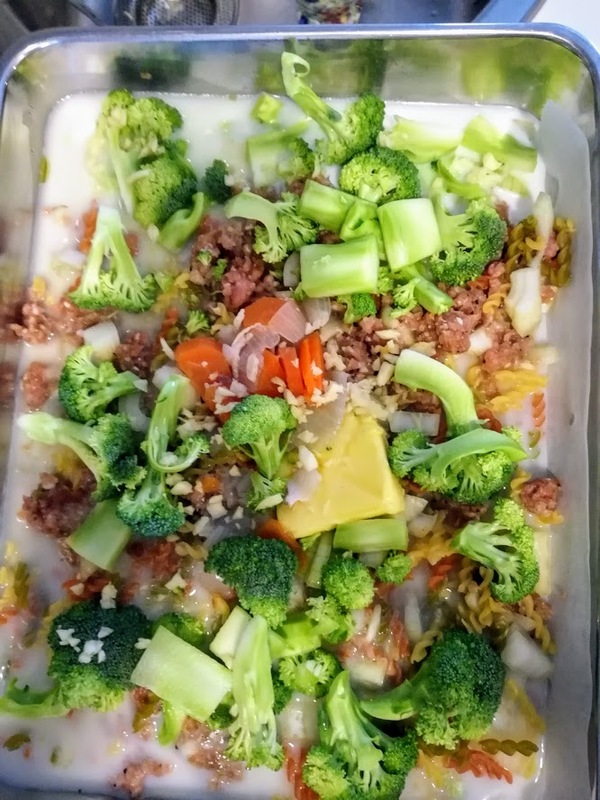 RAW pasta), raw meat, vegetables, milk, butter and chicken broth into the baking dish, give it a quick stir, then pop it into the oven. Pull it out partway through cooking, stir through cheese, then finish baking. Easy peasy. After I had cooked this and left it in the oven, I quickly drove to the pasar malam to grab some fruits before the skies turned dark, came home and dug into this pasta with my lovelies. 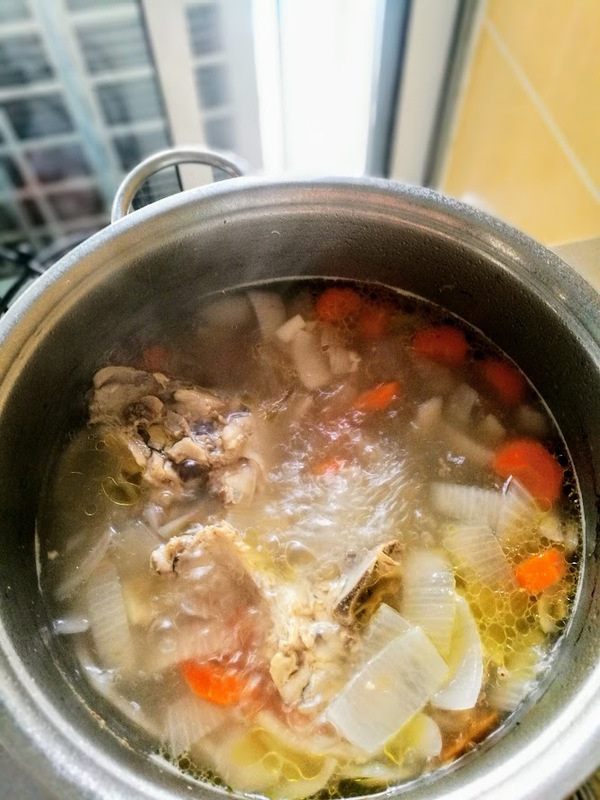 As this recipe requires chicken broth and we don’t use instant broth at home, I made a quick chicken broth using 2 pieces of organic Kee Song chicken (ribs + breast meat), 2 carrots and 1 large onion. Only took 45 minutes to cook this soup and it’s so tasty! You can skip this step if you do not have the time. Just get instant chicken broth from the supermarket. I first tried to use a Le Creuset baking dish but it was too small. I quickly summoned Drama Queen to help me look for a bigger baking dish and she managed to fish out a stainless steel baking tray from some hidden corner. It was so messy to have to transfer the raw ingredients from the Le Creusent to the stainless steel tray What the FISH!! Instead of using chicken fillet as per the recipe, I used minced pork. I marinated the pork with soy sauce, dried thyme, pepper, and 1 big chopped Bombay onion. For the pasta, I use organic mini fusilli. I thought that the portion was too big but it was so delish that my 3 piranhas managed to finish over 3/4 of it. I saved the remaining portion for lunch two days later. You can get the recipe here. 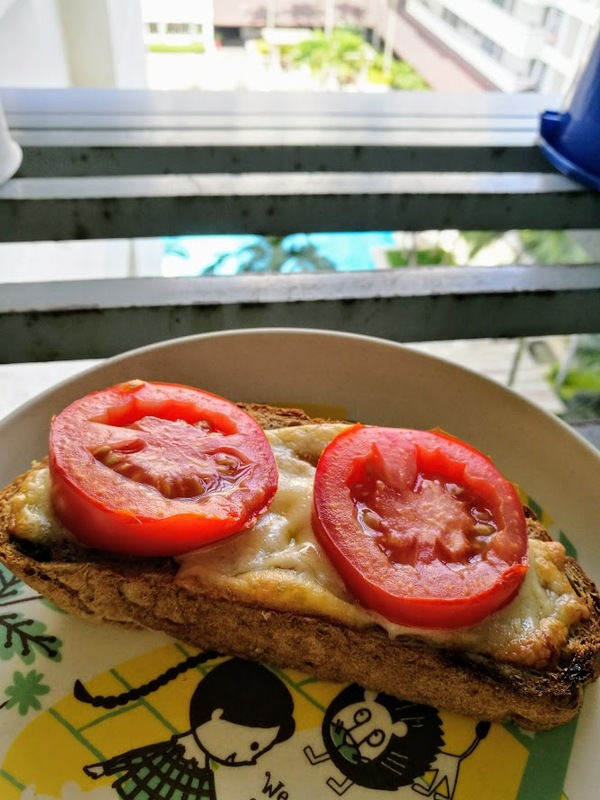 Nagi is my current favorite food blogger and she writes awesome recipes. I tweaked her recipe a little; for eg. I used thyme to marinate the meat instead of rosemary. She used chicken fillet while I used minced pork. I had no plain flour at home and substituted it with corn flour 😀 It turned out beautifully too. Happy trying! I had lunch today all alone. It’s CoCo day in school for Drama Queen and Cass; Alycia only got back at 4pm and the mil had just flown off to Hawaii. I hadn’t planned what to eat for lunch and the thought of take out food from the regular stalls did not appeal to me at all. After getting some groceries from 99 Speedmart, I walked across to the roadside Indian stall to see what they have to offer. I always notice many patrons tucking into the food, under the hot sun, shielded only by a piece of plastic cover above. Such an unassuming stall yet could attract such a crowd. The food must be good and cheap. I took a piece of mackerel fish curry and a piece of chicken curry. That’s enough for me for I have a very small tummy with modest appetite. Back home, I sliced up a cool kyuri and ate the curry that I bought with it together with some jackfruit. 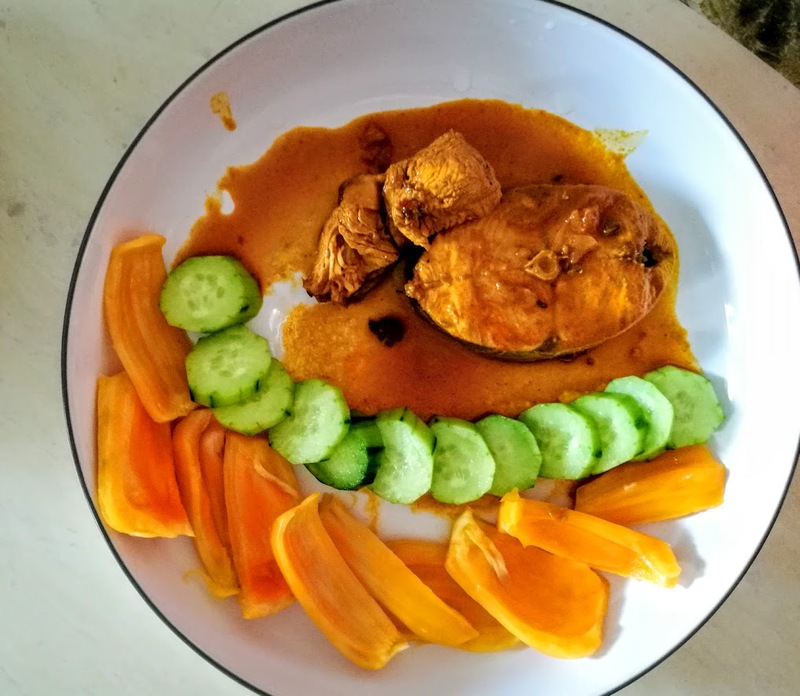 My RM7 lunch – the fish and chicken curry cost RM4, cool kyuri RM1 and jackfruit is about RM2. Light and easy. Low in carbs and high in protein. Definitely my kind of lunch. Jackfruit, known as the jack of all fruits is a rich source of vitamin, minerals, phytonutrients, carbohydrate, electrolytes, fiber, fat and protein. This fruit has no cholesterol or saturated fats. Today’s lunch for Drama Queen and Cass was takeout Mee Siam from our favorite cafe. Cass was super hungry today. When she alighted from the school van, she grumbled “mum, I am SO hungry. My stomach is SO pain and growling. I am going to die from hunger!” The moment she got into the house, she rummaged through the fridge for lunch. She saw the packet of Mee Siam in the fridge, took it out and devoured it like a feral dog. She was supposed to share the packet of Mee Siam with me but she scoffed it down within minutes, still in her dirty school uniform, stinky socks and with ruffled messy hair all over. After she was done with her packet of Mee Siam, Cass said that she was still very, very hungry! OMG, what’s with her appetite?! She must be going through a growth spurt now. “But you have already eaten my share of Mee Siam. There is nothing else to eat. Do you want cheese on toast?” I asked her. There was a twinkle in her eyes. That’s her favorite, why not! Drama Queen likes bringing home cooked food to school. This year, she has to stay back in school every day for UPSR exam preparation classes. When there are extra dishes and rice from dinner, she will keep them in the fridge. The next morning, she will wake up 5 minutes earlier to reheat the food to bring to school. When she’s in the mood, she will cook something up in the evening, for school the next day. Below is the turmeric fried rice that she cooked on her own without any help form us adults. The ground turmeric oil is from the turmeric chicken that we had for dinner. As there was quite a bit of ground turmeric and shallot oil left on the platter, she used the oil to fry some rice, along with some chopped carrots, long beans and 2 eggs. 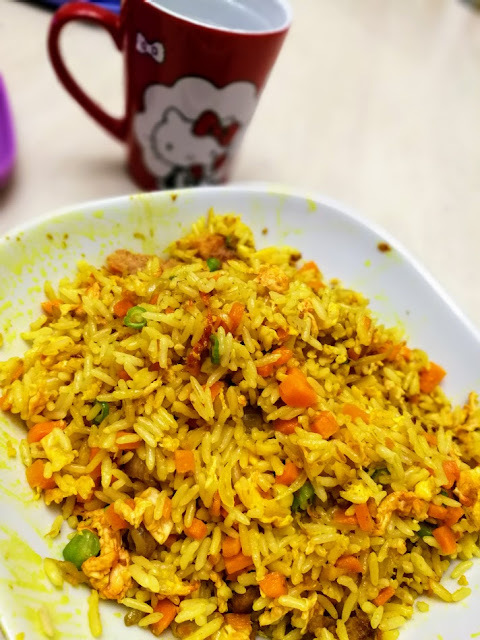 The fried rice was not only aromatic and yummy, it’s very healthy too. The fried rice was enough for her and Cass to bring to school. When our girls got home from school, they darted straight into the kitchen to forage for food (as usual!). Their sharp eyes spotted something new at the counter top. After getting permission from me, they ripped open the packet of salted gula melaka granola and oh my, they almost finished the packet of addictive granola. 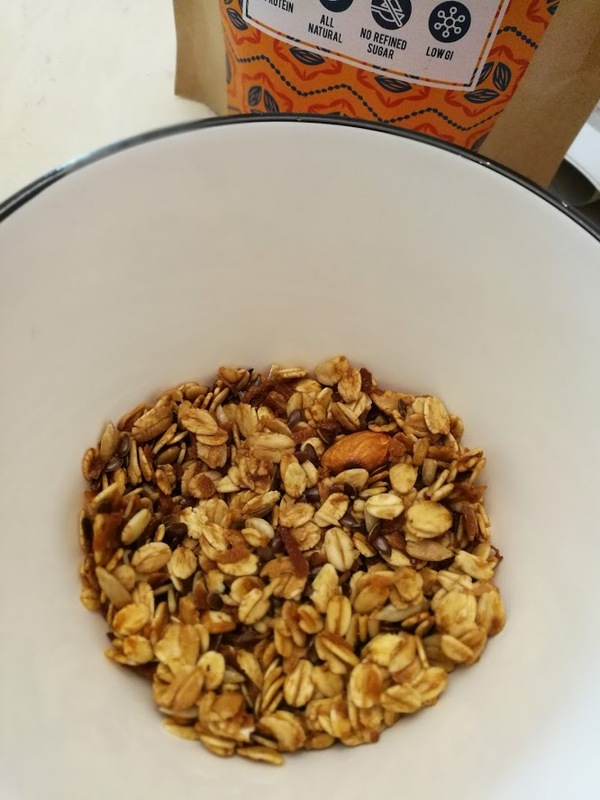 For once, they fell in love with granola. They are not fans of oats and granola but they love Amazin’s granola! What makes Amazin’ Graze’s range of granola stand out from other imported brands of granola is that the granola is very fresh, super crunchy (swoon! ), nutty and ADDICTIVE! 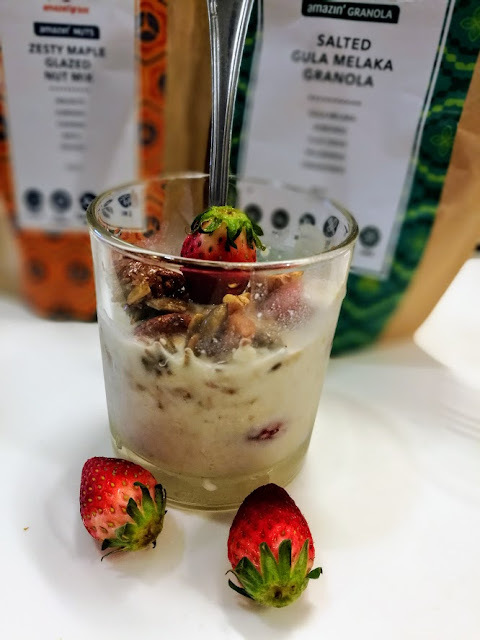 Below – The salted gula Melaka granola has just the right tinge of saltiness, sweetness and every single piece of oat, cluster and nut inside is oh so crunchy! I like the granola eaten on its own to get the best out of its crunchiness. 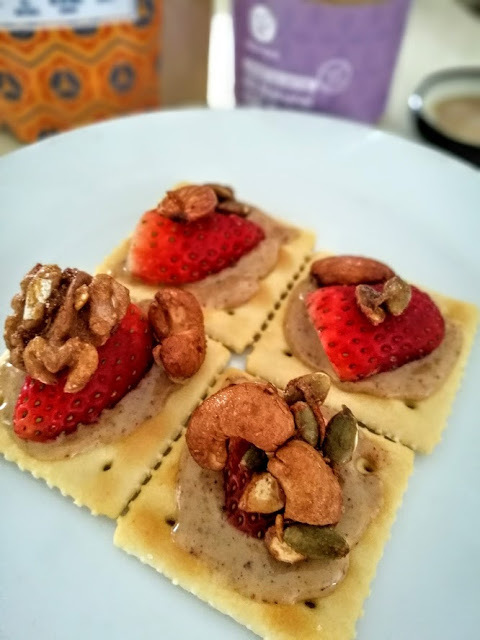 This morning I sprinkled some crunchy granola clusters on my chilled overnight organic oats, threw in some crunchy zesty maple glazed assorted nuts and fresh Korean strawberries. This baby has all the tastes and textures in a cup – from sweet to salty, milky, nutty, zesty, crunchy and fruity. So yummy, refreshing and filled me up until lunch. Amazin’ Graze’s crunchy granola clusters are baked fresh daily and packed with superfoods. Each flavour is uniquely delicious and nutritious! 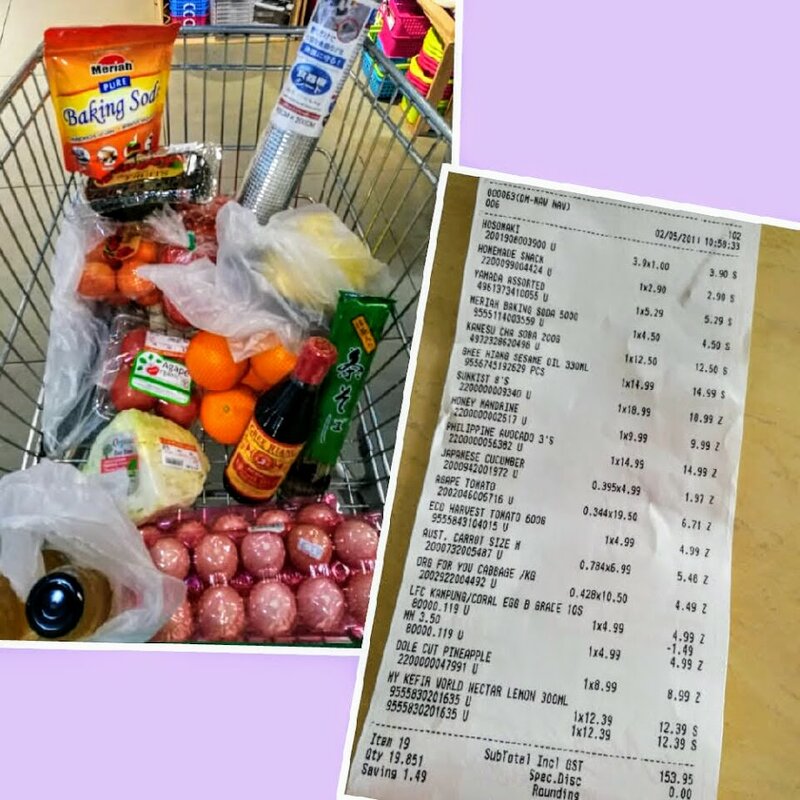 Price is priced reasonably between RM18.90 – RM29.90 for a 250g pack. There is also a gluten-free range priced at RM22.90 for a 250g pack. Amazin’ Graze’s ABC butter is another amazing healthy product. 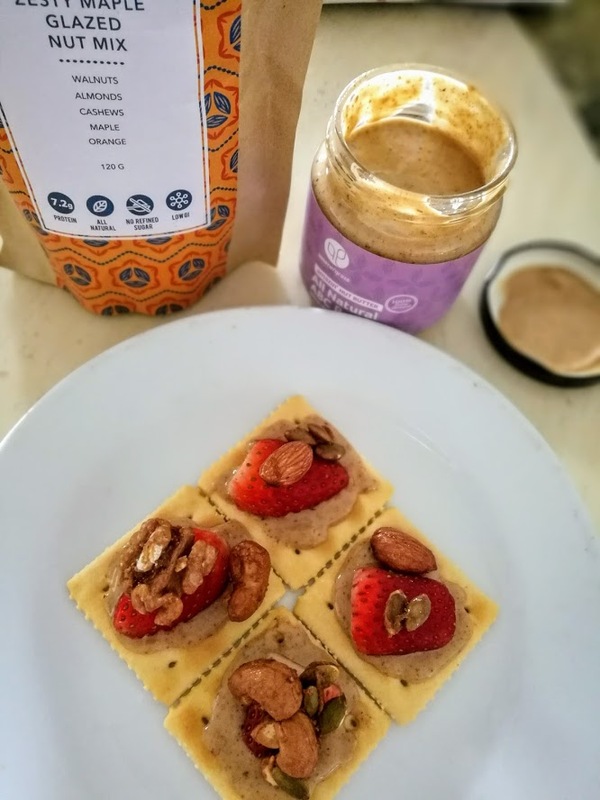 Toasty almonds, creamy cashews and earthy brazil nuts team up in this rich and delicious nut butter medley. Stone-ground and natural with no added salt, sugar, or oil, this butter is healthy and harmonious in flavour and nutrition. Use it as a spread, to add creaminess to cereals, as a dip for fruits and vegetables…or just eat it on its own! Check out Amazin’ Graze’s other amazing nutty butters at their website. ABC butter on crackers topped with crunchy zesty maple glazed assorted nuts and juicy sweet Korean strawberry, yums! To order these amazing healthy snacks, all you need to do is hop over to register online at https://www.amazingraze.co/register/ and receive RM10 off your first online purchase! 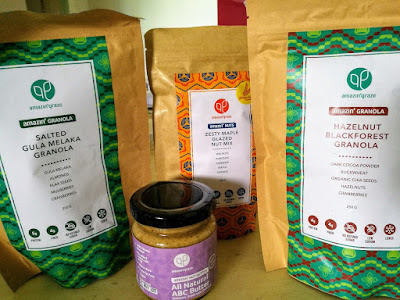 Shipping for Amazin’ Graze’s products are RM6 across the whole of Malaysia. You can earn free shipping for delivery to major cities for orders above RM50.